Driving from Denver we usually join the San Juan Skyway at Ridgway on US550, 26 miles south of Montrose. The Ridgway Chamber of Commerce proclaims, “Fresh Air… Wrap Around Views!” In this case it’s not just hype. The surrounding country often serves as Hollywood backdrop and many local ranches are now owned by celebrities. The town successfully maintains its laid-back, friendly atmosphere – a place where we may find a horse tied-up outside the True Grit Café but can also buy a fine morning espresso at the local coffeehouse. Ridgway State Park, north of town, offers camping, boating, fishing and even a sandy swim beach, somewhat a rarity in Colorado. South of town Orvis Hot Springs is the first we encounter along the route. Facilities at Orvis include indoor and outdoor pools, massage, lodging and camping. Be aware, soaking and other designated areas of the resort are clothing optional. 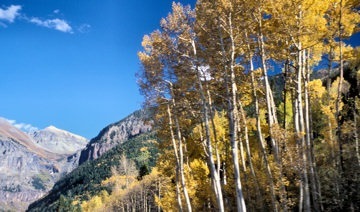 Labeled the Switzerland of America, Ouray lies in a tiny valley ringed by 14,000-foot peaks. Settled after gold and silver deposits were discovered in 1875, the town reflects the wealth from those mines in its many ornate Victorian buildings. Restoration and preservation efforts have once again opened these architectural treasures as hotels, restaurants and bed and breakfasts. The year-round population of 800 swells in summer when visitors arrive to bask in the scenery and outdoor recreation. Perhaps, no where else in Colorado are we so enticed by 4-wheel jeep roads. Some of these steep, narrow “roads” were originally pack-mule trails to the mines. Tour and rental operators open the possibilities for everyone, even if they arrived in the family van. 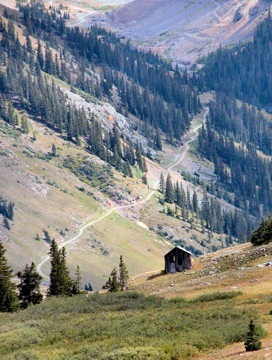 Engineer, Ophir, Black Bear, and Imogene Passes, Yankee Boy Basin, Last Dollar Road, Alpine Loop – destinations seem limitless. Ouray Hot Springs Pool soaks away the aftershocks of a bone-jarring jeep tour or a day of alpine hiking or rock climbing. Over a million gallons of natural hot springs water at temperatures between 96 – 106 degrees soothes and relaxes. Good post, some fascinating details. I believe six of days ago, I have discovered a similar post.